Thinking of adding almond oil into your routine? I say you should try it out, because not only does it smell amazing, but it is loaded with all kinds of goodies for your hair and skin! 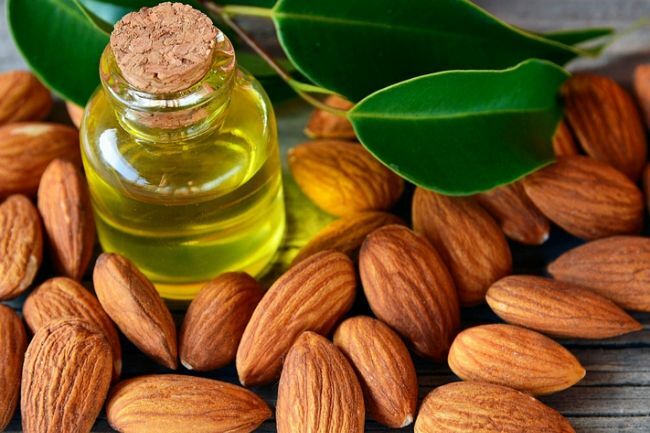 Almond oil can be used an alternative to coconut oil, grapeseed oil, olive oil, and so forth, and makes a great contender as a new staple in your self-care process. Here are my 5 favorite ways I like to incorporate almond oil into my daily life. Since I started using the birth control, I started having pimples on my face and chest. I started applying almond oil on my face and surprisingly the outbreaks started to disappear. I have shared earlier that I have eczema on my hands. I figured that this is caused my washing my hands too often. Luckily, the state of my hands improved as soon as I started applying almond oil. Mix the beeswax and honey in a small cup; place it in a larger bowl with hot water. When the beeswax is melted you can at the almond oil. Mix until you have a smooth paste and let it cool down. Once the mixture is set you can place it into a small cupping glass. Now you have made your own natural moisturizer! Is your skin super dry? Don’t panic! Apply a little almond oil on your skin prior to going to bed and the following morning your skin will be softer than a bunny. Just remember to wait for the oil to absorb before jumping in bed! Thank us later. Is your hair dry and frizzy? Try applying a heated almond oil treatment on your hair and cover it with a plastic cap. Let it sit for a few hours or if your hair is very dry you can also leave it overnight. Why heated almond oil? The heat will open the outer cuticles for your hair, making it easier for your hair to allow moisture penetrate into your strands. Do not apply oil on your hair/scalp when it is too hot. Prior to applying drop a couple of droplets on your hand to determine whether it is too hot. To some this may sound a bit weird, but you can use almond oil when cooking. You can use it for instance, as a dressing in your salads. The advantage of almond oil is that it reduces your cholesterol, because it is loaded with unsaturated fats (the good kind). So how do you use almond oil? Share your uses with us on Facebook!